Some of the very nicest people in the world make and/or collect Teddy Bears. I've been lucky enough to meet many collectors as well as a goodly number of makers, since I began collecting in the 1980's. Any collector of these little critters, eventually wonders if it's possible to make one of their own from scratch. It is a time consuming craft, made more so, if the aspiring maker lacks most of the basic sewing skills or if such skills are relatively dormant. 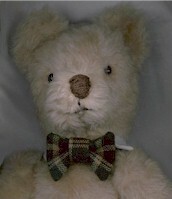 I made a little 12 inch bear from a pattern which was found in the Teddy Bear and Friends magazine, over ten years ago. He was completely sewn by hand, using needle and thread and a backhand overlap stitch. No machine stitching, because my skill at machine use was only good enough to close a torn, straight seam in clothing. Because he was all hand sewn, He took several days to complete and was "born" on July 4th, so I named him Julius. 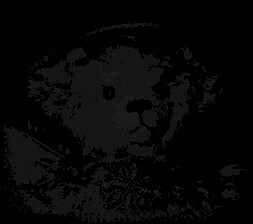 It was just a few days until the beginning of the first ever Bill Boyd's Teddy Bear Jubilee, in 1990, which for the first few years was held at the Park Place Hotel in Kansas City, Missouri. Julius and I headed off to that convention and even though he was very rough compared to the professional standard of most of the bear makers who were at that convention---well known makers such as Kathleen Wallace, The Bear Lady....Monty Sour and "Grandma" Lynn Lumley plus dozens of other wonderful artists, He had been made with love and several other collectors admired his joie de vivre. He went nearly every where with me during the convention, peeking out of the basket I carried and we had a great time! It was at that convention that I met many of the members of the Mo-Kan Teddy Bear Society and found out about this area's Chapter of the Good Bears of the World. It became my first link with local collectors and also with several locally based teddy bear making artists, including Monty Sour and her husband Joe and Bettina Grough who markets her creations under the name of The Glass Dragon. Making Julius gave me even more respect for the well crafted hand made teddy bears that the true Teddy Bear Artist makes. There is one very well known artist who can make five of her creations in one day. She offered one of the workshop programs at the Jubilee several years ago. It was quite interesting. However, I must point out that her "day" started at about 7 AM and stretched throughout her day (with caring for a family and house) until about 10 PM. So bear making, even with a lot of experience, isn't a snap. However, making a bear of your own, will give you a basic knowledge of exactly what goes into the process and may tend to make you a more discerning collector. At the very least, it will give you a new respect for the makers and an understanding of why these little bears can cost so much more than the average commercially produced teddy. Find a pattern. They are often printed in Teddy Bear Magazines or Craft magazines. Check your local library for books on making teddy bears. Trace the pattern pieces on tissue or pattern making paper. There are often some charming patterns available in regular pattern books also. Unless your are a very proficient seamstress, I suggest making a bear of 12 inches or larger, as tasks such as jointing and stuffing will be easier to do in this size bear. After choosing a pattern, read the materials list to determine yardage needs and other supplies necessary to complete your task. Decide on a material. Mohair is one of the best but is quite expensive and difficult to find locally in most places. For Julius, I found a synthetic at a fabric store. Synthetic is a pretty satisfactory material to make a first bear from, although I do know some bear makers who are allergic to it. I'd suggest choosing a synthetic or other fabric that has a tightly woven backing with very minimal stretch (either across or diagonal). The less give to your fabric, the more accurate the pattern will translate to the finished bear. If you wish your first effort to be in mohair you may order as little as 1/4 yard from some mail order places such as Edinburg. (You should be able to find where to order their catalog from information in a Teddy Bear and Friends magazine.) A WEB search will turn up possible leads to suppliers on line. Just be sure you order from a reliable source, as I haven't ordered that way and can give no recommendations. Many of these sources also have sets of jointing materials and glass eyes in many sizes, but you may find that they require minimum orders of more sets than you would be able to use. Many craft stores have departments that offer jointing sets and glass or plastic eyes. Look in the doll department. Julius was made with plastic lock joints. Follow the recommendations of the pattern you are using to determine the size(s) you will need and the number of sets of joints. Most bears are made fully articulated----meaning that they are jointed at the shoulders and the hips (arms & legs) and at the head as well. The plastic lock joints are extremely easy to use, even for a rank beginner. Other types of joints are really preferred by experienced bear makers as they produce a quality product with more endurance, but putting them together requires a bit more skill and generally improves with practice. Julius is still going strong after 9 years and we want you to actually finish this bear so I'd suggest plastic lock joints. I used plastic eyes for Julius that had a snap lock design to hold them in place once you pierced the fabric. There are also other alternatives including glass eyes on wires and glass eyes on loops. Wonderful eyes have been fashioned from antique shoe buttons and appeared on many of the oldest teddies from the beginning in the early days of bear making. Regular buttons of certain types are another possibility for use as eyes. If plastic eyes are all you can find available and you don't like the look, experiment with some of these alternatives or order sets from a supply place. Other items that you will need, include pearl cotton in a contrasting color for the nose, mouth and claws; felt (or something similar) in a matching or contrasting color for paw and foot pads; and fiber fill stuffing. Since I love bears with "growlers", I also added one of those to my shopping list when planning Julius. He still greets me when I pick him up and he had a pointer or two for me on how to take his picture for this article. If you can run a sewing machine and have a machine that isn't intimidated by thicker fabrics such as synthetic fur, and if your pattern isn't too small, by all means, do the majority of stitching by machine. Just read sewing instructions in your pattern carefully to leave seam openings large enough to turn the sewn pieces right side out and also to maneuver the joints and stuffing. Be sure to clean out the machine (around the bobbin, etc.) afterwards, as the fibers (especially synthetics) can clog up the works and cause you problems later. Foot pads and paw pads of felt, velvet, leather or ultra suede are a part of many teddies. They are not really as difficult as you might think but I would suggest sewing the foot pads in by hand, as I've never had much luck doing this close work and the intricate turning required by machine. Paw pads, on the other hand are sewn onto the arm before sewing the front and back arm pieces together and it is a pretty easy step. Even I had no trouble with that part! One good tool to help with turning the pieces and also for stuffing is the handle of a plain wooden spoon. That should get you started on your way to making a Teddy Bear. Good Luck, Have Fun and I hope you will Love the finished Him or Her as much as I Love Julius. P.S. Don't forget to buy your new friend a ribbon to go around it's neck. You might want to wait until your bear is born and take it shopping with you. You would be amazed at the fun you can have in the store while shopping for that ribbon. Just stroll right into the store with Teddy draped over your arm and begin your little shopping expedition. A few murmured words to Ted to find out his preferences in color and style should get the ball rolling. Some people will think you are crazy but an equal number will completely understand.